Gender nonconformity is the major civil rights movement of our time. As members of this and leaders of the next generation, it is so important to become educated on the rapid and radical shifts in societal thinking, regardless of our personal opinions or beliefs. National Geographic, realizing this, developed a special issue to look at cultural, social, biological and personal aspects of gender. Now, as unprecedented (IMO) as this is, it is important to remember that just because a new movement begins, doesn’t mean the old fights are over. Take the cover of the issue, for example. It identifies individuals in a range of gender identities, but somehow neglects to include a female. I am not the first to point this out, and you can read a deconstruction of this and the alternate cover here. I originally thought this issue would be devoted primarily to developing an understanding of the transgender community. However, it addresses gender across the spectrum which is even more pressing, since shifts in the gender norms effect everyone, not just those in specific communities. The issue opens with a short Q&A with writer and activist Gloria Steinem and author, activist, and tech executive Sheryl Sandberg. I found Sandberg’s commentary more poignant than Steinem’s because it was less existential and more direct, but both had great things to say. The next section of the magazine is a glossary of gender-related terms, developed in consult with scholars of the subject. This is a great and informative section that gives a good background on the foundation of the movement. An even more important section follows called Helping Families Talk About Gender, which is a must read for anyone who interacts with children. I was really excited to read about Girls, Boys, and Gendered Toys but this section takes up less than one half of one page, and only barely touches on issues like that fact that “girls” puzzles have fewer pieces and the girl oriented product line Lego Friends focuses on playacting, not construction. I think this is a really important issue and I’m disappointed to see it given so little space in this Special Edition. 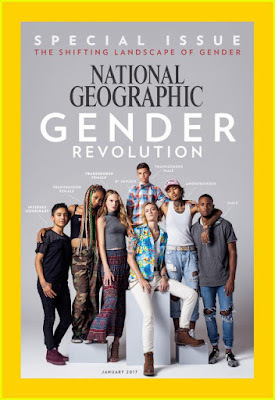 National Geographic Gender Revolution continues on to look at how gender is defined by children and for children. A good excerpt from this section can be found here. The magazine also interviews several nine-year olds to find out how they think their lives might be different if they were a boy or girl. The answers are often disheartening but not at all surprising. We also get a wonderful(ly depressing) infographic on the gender gap index (determined by health, education, economic, and politics) across the world where we see that there is not one country where females are even close to reaching equality with males. The next 25 pages focus on Rethinking Gender primarily among adolescents. This is also a terrific read for parents or anyone who interacts with children because it fosters understanding of how children and adolescents are defining their gender identity in today’s society, where terms like gender nonconforming are replacing terms like tomboy, and how to help children and adolescents navigate this already confusing time in their lives when they are expected to balance personal feelings with societal pressure. We next get an exposition on defining masculinity and then a rather lackluster section on females. Tucked away at the end of the magazine, the section devoted to women takes up 50 pages, 30 of which are photographs. Now, this is more space given to females than males, but the discourse on masculinity, particularly men in western society, is much more nuanced. The American Girl section is given 6 pages of text, all 6 of which are devoted to body image. In highlighting body image as the most important cultural issue among females in today's western society, National Geographic is essentially still contributing to the problem by implying that body image is the only thing important to women. Of course, body image is an important issue that girls in the US and other western cultures face, but it is not by any means the only one. There is no analysis of other primary female gender-related issues in today’s society like wages, education, politics, workplace dynamics, etc, except for the aforementioned infographic and another pictorial noting international statistics and titled: It’s Hard to Be Female -- but there is no exposition on what that actually means. Overall, I commend National Geographic for devoting an entire issue of their iconic magazine to this important discourse. I wasn’t able to find any good statistics on their reader demographic, but I presume there were more than a few subscribers who were shocked to see this in their mailbox. I hope they read it, and honestly, I hope you read it to. As I’ve said numerous times, many sections of this edition are must reads for anyone who interacts with children, as the cultural landscape is shifting so rapidly in terms of defining gender. I think it’s a great thing, personally, I just hope that the existing gender problems don’t become overlooked as we expand into a new era. However, if we can achieve a gender nonbinary society these gender-based differences should cease to exist all together. National Geographic provides a downloadable discussion guide for parents and teachers if you are interested in more information. You can buy the magazine online or anywhere where National Geographic is sold. I got mine at Costco for $4. There will be an accompanying TV program airing on Feb 6 at 8/7c on the National Geographic channel. You can see a sneak peak here.